DeForest Area High School Resource Officer Brian Johnson and DeForest Area High Schooler Mitchell Lara competed in a race, Fast and the Furious style, in the high school parking lot. The stakes were high — pink slips were on the line. 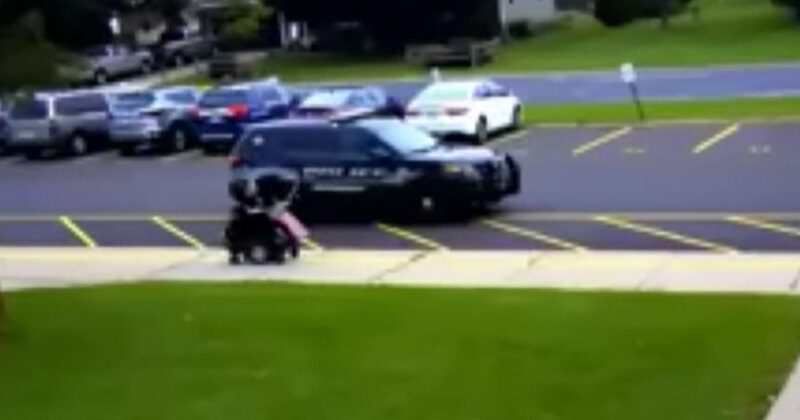 Depending on who lost, the winner would either receive Officer Johnson’s squad car or Mitchell’s motorized wheelchair. In the end, however, the two got to keep their respective vehicles as the race concluded in a tie. The video of their thrilling race went viral, helping Mitchell to come out of his shell a little more. As a young man with cerebral palsy, Mitchell has some trouble speaking, but the video of his daring performance does all the talking for him. Not only was the viral video beneficial for Mitchell, but also for the DeForest Police Department as well. With all the tension between the police and citizens in the news recently, the video serves as a kind reminder that the police are not only there for serious affairs. The humorous interaction helps to break down barriers and encourage the development of better relationships with police forces and their citizens. “[People need to] know that we’re not always there to write them a ticket, arrest them or charge them with a crime or something along that line,” says Sergeant Berg. And that message is probably the most important takeaway from the video. At the end of the day, the police are people whose power comes from the people. Ultimately, they are there to serve and protect us, but that doesn’t mean they can’t have playful breaks every once in a while — and what better way to do that than with a good ol’ fashioned street race?